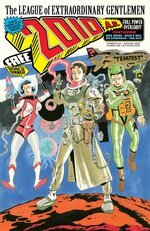 SPX 2017 Marks 20 Years of Top Shelf! This weekend, America's indie comics community descends once again on our nation's capital for the Small Press Expo (SPX), September 16-17, 2017 at the Bethesda North Marriott in Rockville, MD. And Top Shelf will be spending it as we've done for 20 years now: bringing you brilliant comics from veteran creators and brand-new talents alike! And on Saturday only, Andrew Aydin (March)! Plus plenty more members of the Top Shelf family (Jess Fink, Liz Prince, etc) around the room. It's all happening at SPX Table W64-67! Sh*t My President Says breaks the internet! 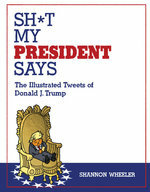 Congratulations to Shannon Wheeler, whose new book Sh*t My President Says: The Illustrated Tweets of Donald J. Trump comes out in stores today & tomorrow. 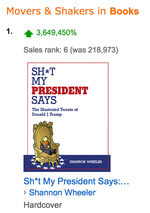 This 120-page hardcover, in which the award-winning cartoonist and satirist tackles the 140-character president, has blown through the roof with a staggering 3,649,450% climb on Amazon's bestseller charts, easily reaching #1 on the "Movers & Shakers" list and cracking well into the top 10 of all books! For more on Sh*t My President Says, visit Shannon's interview with the Washington Post, or visit the book's official web site! Welcome to SUPER TOKYOLAND and I AM A NUMBER! With striking detail and easy charm, Super Tokyoland is a perfect hybrid of European and Japanese comics, forming a rich exploration of immigrant life. Check out a 10-page preview! Rian Hughes has got your number! When everyone has a number, everyone knows their place. Lower numbers are better, higher numbers are less important, and that’s just the way it is. But what if that number could change? You might try to buck the system and assert your individuality… or you might end up with a big fat zero. Big questions are explored and unexpected answers found in the first solo comics collection from award-winning designer & illustrator Rian Hughes. His whimsical, witty, and insightful strips reveal the lighter side of our obsession with social rankings. Where do you stand in the pecking order? Is your number up? Check out an 8-page preview! 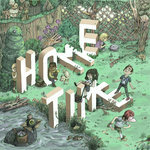 Announcing ROOTS and BOTTLED, two gripping graphic novels for September! There's nothing quite like a debut. 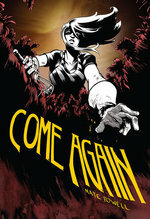 The thrill of discovery — when an amazing new talent pops out of the ether, blending familiar influences with a fresh perspective and personal touch that's all their own — is one of the great joys of reading indie comics. 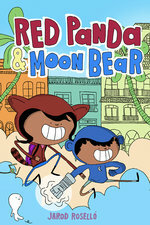 This month, we're delighted to announce two excellent cartoonists' first graphic novels. On a journey to the old world — she discovered a whole new world. After a messy year of heartbreak and setbacks, Tara sets off to Ireland in search of clues to her family’s ancestry, but what she finds isn't at all what she expected. Some of it has to do with the lack of records, but a lot has to do with John, the charming cartoonist she met on Twitter. Wrapped in real family history and set amongst the natural beauty of the Irish countryside, Roots is a classic romantic-comedy adventure and a page-turning account of a young woman finding herself. 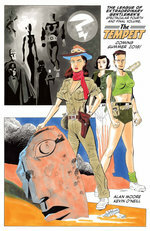 black & white softcover graphic novel with French flaps, 5" x 8"
Check out an 11-page preview! Jane is sick of her dead-end life in the suburbs, and desperate for a change. Her old friend Natalie made it out, living in Japan as a fashion model. Now, as Natalie comes back to town on business, Jane sees a way for her friend to do her a favor… whether she likes it or not. 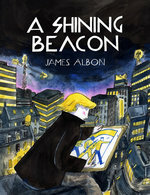 Young Australian cartoonist Chris Gooch debuts with a haunting portrait of millennial alienation, tinged with body horror and Greek tragedy, glamour and terror. 2-color softcover graphic novel with French flaps, 5.8" x 8.3"
Shannon Wheeler knows Donald Trump pretty well — or at least his Twitter account. Wheeler read the president's complete archive of over 30,000 posts and illustrated over 120 of the best tweets for his new book Sh*t My President Says: The Illustrated Tweets of Donald J. Trump. Now, in reaction to rumors that Trump (despite all advice to the contrary) plans to "livetweet" the Senate testimony tomorrow of former FBI Director James Comey, Wheeler has announced that he will live-draw Trump's livetweets, bringing vital new insight to these important contributions to American presidential history. In Sh*t My President Says (in stores August 2017), Eisner Award-winning cartoonist Shannon Wheeler tackles the 140-character president. For the first time, Donald Trump's most revealing tweets are collected, curated, and transformed into razor-sharp cartoons, offering a subversive and illuminating glimpse into the mind of the most divisive political figure of our time. Whether you love him or hate him, this take on Trump will help you come to grips with the man and his ideas thanks to Wheeler's signature mix of slapstick and sophistication. Sh*t My President Says will be a 120-page hardcover book, 5” x 6.5”, published by Top Shelf Productions, an imprint of IDW Publishing. 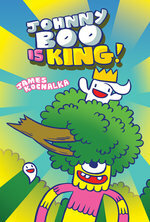 It features a foreword by Esquire cartoon editor Bob Mankoff. The book goes on sale August 2017 and can be pre-ordered now with ISBN 978-1-60309-410-8 wherever books are sold. For more details and sample pages, visit www.sh-tmypresidentsays.com. Now in Previews: Sh*t My President Says, Spacebat & the Fugitives, and new Korgi! 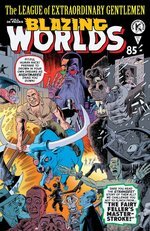 Top Shelf continues our summer 2017 rollout with red-hot political humor, all-ages outer-space action, and a whimsical celebration of woodland fantasy — all in this month's Diamond Previews catalog! 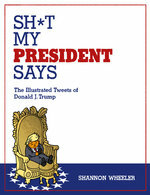 In Sh*t My President Says: The Illustrated Tweets of Donald J. Trump, Eisner-Award-winning cartoonist Shannon Wheeler tackles the 140-character president. For the first time, Donald Trump’s most revealing tweets are collected, curated, and transformed into razor-sharp cartoons, offering a subversive and illuminating glimpse into the mind of the most divisive political figure of our time. Click here for details and a preview! "Unrelenting stylishness," said the Village Voice. 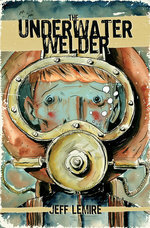 "Truly jaw-dropping," said Pipedream Comics. "Glorious," said Paste. Now, Chris Sheridan follows the success of The Motorcycle Samurai with a brand-new graphic novel for all ages! Spacebat, the galaxy’s greatest misfit, is pressed into service by three kids to stop a mad scientist, his army of ill-mannered robots, and a universe-bending machine. Christian Slade celebrates ten years of his heartwarming wordless fantasy adventure series, Korgi! This 48-page monster issue is stuffed with Korgi stories previously published in Free Comic Book Day specials, plus a brand-new "tail." 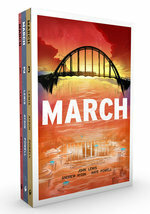 MARCH: BOOK THREE Nominated for Eisner Award! 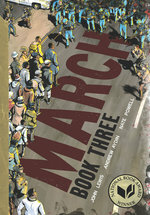 Congratulations are in order once again for Congressman John Lewis, Andrew Aydin, and Nate Powell, as their record-breaking graphic novel March: Book Three has been nominated for Best Reality-Based Work in the 2017 Will Eisner Awards. 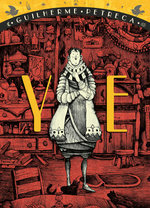 The trio won last year in the same category for March: Book Two, while Book Three has received an unprecedented array of honors, including the National Book Award, the Printz Award, the Coretta Scott King Award, and many others. Join us at the Eisner Award ceremony this summer at Comic-Con International in San Diego, July 21, 2017! Meet the SURFSIDE GIRLS — coming this summer! 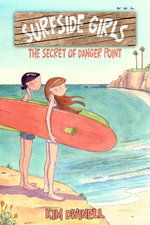 It may not be summer yet, but the sun is finally out, and if you listen closely, you can hear the waves calling... That means it's time to welcome Kim Dwinell to the Top Shelf family and introduce the world to her debut graphic novel, Surfside Girls: The Secret of Danger Point! We're so excited to be working with Kim. She's a California-based animator, teacher, and former lifeguard who now combines all her talents into one irresistible book. Check out an 8-page preview of her beautiful watercolor pages, and get ready to join twelve-year-old heroes Samantha and Jade as they investigate spooky ghosts, creepy creatures, greedy politicians... and cute boys! It's 232 pages of full-color adventure, surfing your way this summer. Click here for more details and pre-order now from your favorite shop!